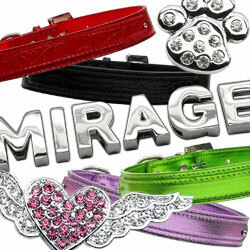 Add a little bling to your dog's look with these gorgeous bling dog collars and charms. Doggy In Wonderland has many dog charms to choose from. You can spell your special fur-baby's with chrome letter sliders or bling letter sliders. Choose a special charm to add to the beginning or end of their name for extra blingy spice. **Please Note: Dog collars and charms are available in either 10mm or 18mm sizes. Please be sure to order the correct collar and charm sizes to match! Enamel Bow Charm - 10mm only!.. Personalized dog collars for your precious pups are cute and fun. Add 10 mm bling letter charm..
Faux Croc Two Tier Collar for Doggys! Holds 10mm and 18mm letters to spell your fur babies name with..
Metallic doggy collar that holds 10mm charms or 18mm charms for larger doggys! Spell out your precio..
One Tier Ice Cream Doggy Collars These cute dog collars hold 10mm letters and charms for your pre..
Slider Bone Charm - 10mm only!.. Slider Bone Charm - 18mm only! ..
Slider Flag Charm - 10mm only! Patriotic bling for your pup's collar!.. Slider Flying Heart Charm! Comes in 10mm and 18mm. Add a touch of style to your pup's collar!.. Slider Heart Charm - 18mm only!.. Slider Paw Charm! Available in 10mm and 18mm sizes........................add a little extra blin..
Slider Puffy Heart Charm - 10mm only!.. Slider Star Charm - 10mm only!..